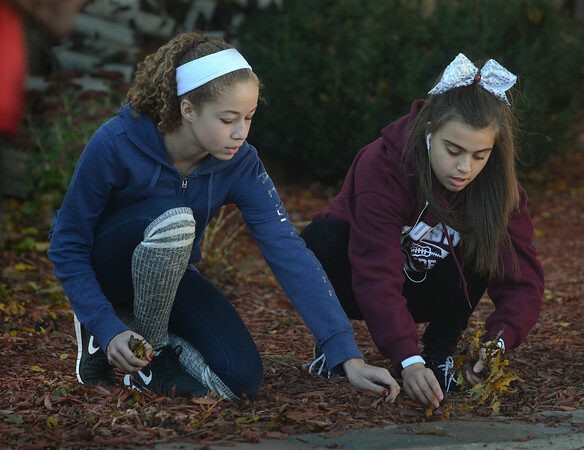 Seventh-graders Hope Miller, left, and Kristina Koulouras pick up leaves from a lawn Friday on Maplewood Avenue, during O'Maley Innovation Middle School's "Day of Service." In what has become an annual tradition at the school, students from the 6th, 7th and 8th grades went to various locations around town to help residents, particularly the elderly, with raking and other Fall cleaning chores. "Tax dollars from the community benefit O'Maley, but not everyone has children at O'Maley," said 7th grade teacher Kim Shea. "This is our way of coming out and saying thank you."